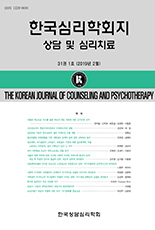 김시연, 서영석,(2011).음악방송 노출을 통한 성적대상화 경험이 여자고등학생의 부정적 섭식행동, 수행불안 및 학습몰입에 미치는 영향.한국심리학회지: 상담 및 심리치료,23(4),1137-1160. 본 연구에서는 대상화 이론 및 선행연구 결과를 토대로 음악방송 노출을 통한 성적 대상화 경험이 사회문화적 가치의 내면화, 신체감시 및 신체 수치심을 매개로 부정적 섭식행동, 학습몰입 및 수행불안에 영향을 미치는 인과적 구조모형을 설정하고, 서울 소재 고등학교에 재학 중인 여자고등학생 282명을 대상으로 모형의 적합도를 검증하였다. 특히 음악방송 노출이 부정적 섭식행동, 학습몰입 및 수행불안에 미치는 간접효과를 확인하기 위해 부트스트랩 절차를 적용하여 간접효과의 유의도를 확인하였다. 우선, 가설모형은 자료에 적합한 것으로 나타나 대상화이론이 한국여자고등학생에게도 적용 가능한 이론임이 입증되었다. 또한 음악방송 노출과 종속 변인 간 직접효과를 설정한 경쟁모형에 비해 내면화, 신체감시 및 신체수치심의 완전매개효과를 가정한 가설모형이 더 적합한 것으로 드러났다. 한편, 사회문화적 가치의 내면화는 음악방송 노출과 부정적 섭식행동, 학습몰입 및 수행불안 간 관계를 매개하는 주요 변수이자 영향력이 가장 큰 변수로 나타났다. 연구결과를 토대로 시사점과 추후연구를 위한 제언을 논하였다. The present study investigated whether music television exposure, disordered eating, learning flow, and performance anxiety were related and that those relations were mediated by internalization of sociocultural attitudes towards appearance, body surveillance, and body shame. 282 female high school students were recruited for this study. Results from structural equation modeling analysis indicated that after controlling for body mass index, the hypothesized fully mediated model showed an adequate fit to the data. All direct paths of interests were significant. Music television exposure significantly predicted internalization and body surveillance, internalization significantly predicted body surveillance and body shame, body surveillance significantly predicted body shame, learning flow and performance anxiety, and body shame significantly predicted eating disorder. The bootstrap procedure exhibited that the links between music television exposure and psychological consequences were fully mediated by sociocultural attitudes towards appearance, body surveillance, and body shame. Implications to counseling practice and future research are discussed.